Eliminating internal and external barriers affecting national research and education networks (NRENs) in the UbuntuNet Alliance membership region should be the core of the NREN agenda in 2015, argues distinguished NREN advocate Duncan Martin. Duncan Martin, former CEO of TENET, the South African NREN, has for the past 15 years been supporting the development of NRENs in Africa. He has recently spearheaded the establishment of BERNET, the NREN of Burundi, which was accepted as the 15th NREN Member of the UbuntuNet Alliance. Read NUANCE's exclusive interview with Martin here. Image courtesy NUANCE. Eliminating internal and external barriers affecting national research and education networks (NRENs) in the UbuntuNet Alliance membership region should be the core of the NREN agenda in 2015, says distinguished NREN advocate Duncan Martin. The UbuntuNet Alliance is a regional association of NRENs in Africa. It was established in 2005 with the goal of securing high-speed and affordable internet connectivity for the African research and education community. In an interview with NUANCE, the monthly e-newsletter published by the UbuntuNet Alliance, Martin observes that although the UbuntuNet Alliance has registered success at policy level, as evidenced by the steadily increasing NREN members, more needs to be done at NREN-level to address organizational and other internal challenges that plagued NRENs in 2014. "My conclusion is that the Alliance is succeeding well at the political level - in growing its membership and as regards its recognition within the region and generally as one of the major regional research and education networks (RENs) of the world. Efforts must continue to assist REN project teams in Botswana and Zimbabwe and in the other countries that have yet to establish NRENs and join the Alliance," says Martin. Martin adds that "… some member NRENs face organizational, technical, budgetary, and/or regulatory difficulties that somehow prevent them from interconnecting with UbuntuNet and so participating in research and education networking. This is bad for the entire REN community and we must work harder to enable these NRENs to participate." 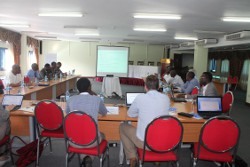 UbuntuNet Alliance NREN heads meet at a recent capacity-building training session held in Entebbe, Uganda. Image courtesy NUANCE. According to Martin, a solution is not far off as AfricaConnect2, a continuation of the highly successful AfricaConnect project, is expected to inject increased operational efficiency into the Alliance and add value through the delivery of much needed services tailored to meet the specific needs of the user communities on the continent. "The AfricaConnect project is great value in this regard, as is demonstrated by the global REN services that the Alliance is delivering to RENU (the Research and Education Network for Uganda) and to ZAMREN (the Zambia Research and Education Network) using intercontinental and regional network capacities deployed by the project. Hopefully AfricaConnect 2 will be a prime focus during 2015," says Martin. The UbuntuNet Alliance plans to address the constraints encountered by NRENs in the past year through strengthening business training for chief executive officers (CEOs) and chief technical officers (CTOs). In 2015, the UbuntuNet Alliance is set to introduce new NREN business training programs tailored for CTOs. The UbuntuNet Alliance will further prioritize creating sustainable and operational NRENs in all countries in the membership region. This article is republished with permission from the latest issue of NUANCE, where you can also find the full in-depth interview with Martin.